Group A – Senate (5-1), AFP (4-1), PNP (3-2), GSIS (3-2), BFP (3-3), DOH (1-4), COA (0-6). Group B – Malacanang-PSC (5-1), Judiciary (5-1), NHA (5-1), DA (2-4), PDEA (2-4), DOJ (1-4), Ombudsman (0-5). GOVERNMENT Services and Insurance System (GSIS) made the race for the last two berths in the second round of the 6th UNTV Cup more interesting with an 81-75 win over Bureau of Fire Protection held over the weekend at the Olivarez Sports Center in Paranaque. The BFP Fire Fighters dropped to fifth place with a 3-3 card in the tournament organized by UNTV president and CEO Daniel Razon. 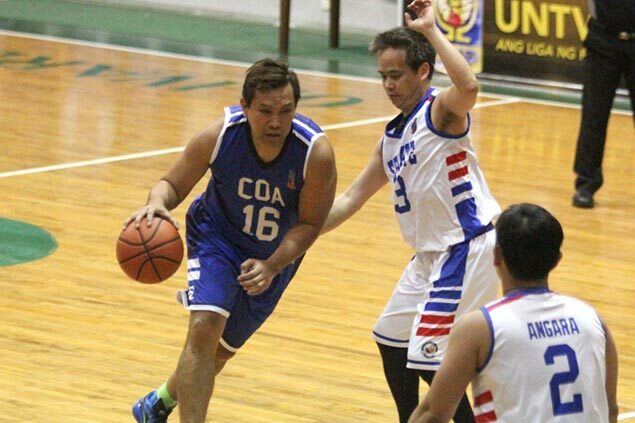 Senate topped the group with a 5-1 record following a 105-72 drubbing of also-ran Commission on Audit – thanks to another solid game from Sen. Joel Villanueva. Also assured of a second round slot in the event offering P4 million to the chosen charity of the champion team is two-time champion Armed Forces of the Philippines. Meanwhile, the National Housing Authority Builders forged a three-way tie for first in Group B with an 81-73 victory over the DOJ Justice Boosters. With the win, NHA drew level with Malacanang-Philippine Sports Commission and Judiciary – all with similar 5-1 cards.